1919: (Edward) Stinson Airplane Syndicate, Detroit MI. 1926: Stinson Aircraft Co, Detroit. 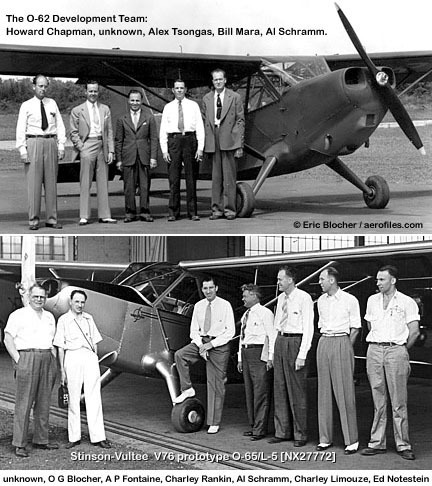 1927: Stinson Aircraft Corp, Northville MI; 1929: Wayne MI. 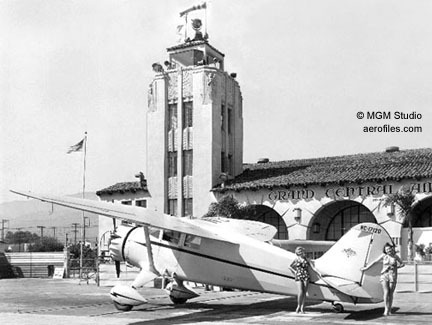 1931: Merger with E L Cord Corp. 1940: Stinson Aircraft Div, Vultee-AVCO, Wayne. 1946: Stinson Aircraft Div, Convair. 1948: Stinson Div sold to Piper Aircraft Co, Lock Haven PA. 1962: Inventory and rights sold by Piper to Univair, Aurora CO.
10 Voyager (Model HW-80) 1939 (ATC 738) = 3pChwM; 90hp Franklin 4AC-199; span: 34'0" length: 21'8" load: 677# v: 115/108/47 range: 330 ceiling: 13,000'. POP: 260, of which 6 to USAAC as YO-54, 1 to RAF, and only a few of 600 ordered by France. Design modified into WW2 L-5. 10-A (Model HW-90) 1941 (ATC 738) = 90hp Franklin 4AC. $3,355; POP: 500, of which 8 to USAAF as O-49/L-9 with Franklin O-200. 10-B 1941 (ATC 738) = Conversion of 10-A to 75hp Lycoming GO-145-C3. POP: 1 [NC27714] c/n 7761. 74 aka Vultee-Stinson V74 1940 = Prototypical L-1 with full-span automatic slots and slotted flaps for Army evaluation as laision; ff: 7/15/40 (p: Al Schramm). Operated in and out of a 200' circle. 75 aka Vultee-Stinson V75 1940 = First prototype of L-5, militarized from Model 10 with 100hp Lycoming; ff: 6/19/40 (p: Al Schramm). A P Fontaine. POP: 1 as 75B, modifed with 125hp Franklin as 75C [NX27711]. 76 Sentinel aka Vultee-Stinson V76 1940 = 175hp Lycoming; ff: 6/28/41 (p: Al Schramm). A P Fontaine. Full-span slots, which created a problem during testing with near-fatal results. With modification to half-span slots and enlarged tail surfaces it became final prototype for L-5. POP: 1 [NX27772]. 105 Voyager, HW-75 (Model HW-75) 1939 (ATC 709) = 3pChwM; 75hp Continental A-75-3; span: 34'0" length: 22'2" load: 657# v: 105/100/43 range: 350 ceiling: 10,500'; ff: 2/3/39 (p: Al Schramm). "105" designation was unofficial, indicating cruising speed and used for publicity when first introduced at NY World's Fair. Peter Altman, William Mara, Maurice A Mills, Lewis E Reisner. $2,995, available in 1940 with 80hp Continental for $3,375; POP: 275, included 20 to RCAF. Design modified in 1941 as Stinson-Vultee V76 with 185hp Lycoming O-435. Michigan Central Airways, or Airline, was a route authorization obtained after WW2 by (Roscoe) Turner Aviation. To keep the route it had to be flown once a year, and by an airline, so MCA flew one year with a war-surplus Cessna UC-78, one year with a Stinson Reliant, and one year with 1948 Stinson 108-3 [NC6264M]all generic planes with no MCA logos them. Routes were sold around that time to Capital Airlines, who flew them with DC-3s and -4s. 108, Voyager 150 (Convair) 1944 (ATC 767) - 3-4pChwM; 150hp Franklin 6A4-B31; span: 34'0" length: 25'3" load: 944# v: 133/125/48 range: 550 ceiling: 14,000' (data for 165hp 108-3); ff: 12/1/44. B J Simmons. Enlarged 10-A. 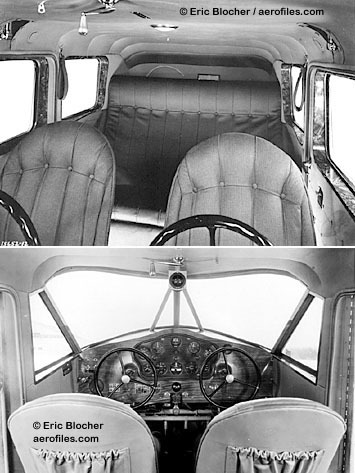 $5,000, $5,489 in 1946; variant 2p Flying Station Wagon for $5,745; POP: 742; prototype with 125hp Lycoming [NX31519]. In the 1960s Chambers Aircraft Co of Greenville TX offered tricycle-gear conversions for Voyagers. 108-1 1947 = Cosmetic improvements. POP: 1,508. 108-2 1948 = 165hp 6A4-B3; v: x/130/50. $6,250; POP: 1,250. 108-3 1948 = Renamed Piper-Stinson, enlarged tail and fuel tanks. POP: 1,760, included 125 built by Piper, some with a smaller, Piper-designed vertical tail; 18 exports to Spain. 108-5 1963 = 180hp built by Univair Aircraft Corp; POP 1 [N5576V]. Many refitted with Lycoming O-435. 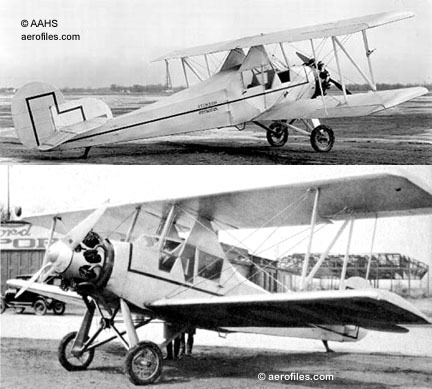 A, Amphibian 1931 = 5pChwMAm; two 215hp Lycoming R-680. Very Sikorsky-like. POP: 1 [NX11117] c/n M-7000. Project abandoned after unsatisfactory testing and a wheels-up landing. 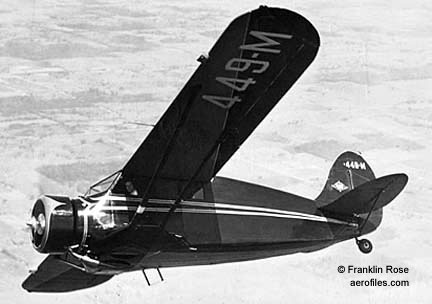 A 1934 (ATC 556) = Commercial feeder airliner. 10pClwM rg*; three 245hp Lycoming R-680-B6; span: 60'0" length: 35'10" load: 3000# v: 180/163/63 range: 640 ceiling: 17,000'; ff: 4/27/34. Robert Ayer. *Partially retracting gear. $37,500; POP: 31 [NC14141, NC14566, NC14597/14599, NC15105/15110, NC15134, NC15152/15165, NC16110]. Of those, 16 went to American Airlines and 3 to Delta Air Lines; 4 to Australia [VHUGG, VHUHH, VHUKK, VHUYY]. 3 had 245hp R-680, and 2 were converted in 1943 to twin-engine. One salvaged from an Alaskan wreck and restored to flying condition 1998 [N15165]. AT-19 aka Stinson-Vultee V77 (Vultee) 1942 (ATC 774) = Military production of SR-10J as personnel transport and trainer, and ostensibly the end of the Stinson line. 1-5pChwM; 300hp Lycoming R-680; span: 41'11" length: 28'3" load: 1340# v: 145/120/60 range: 575 ceiling: 14,000' (data for AT-19). POP: 500 (SEE following sidebar), with most going to Great Britain under Lend-Lease as Reliant I/II/III/IV, but registered and used by USAAF as AT-19 [42-46640/46889, 43-43964/44213], and with 62 to USN [30481/30542]; 1 with 450hp P&W R-985 as V77-B [NX39414]. AT-19, -19A 1942 = 3p instrument and navigation trainer. POP: 8. NOTE: Civil Voyagers were provisionally assigned the AT-19A and -19B designations before becoming L-9A and -9B, which often causes confusion in the ranks, but Reliant was the official AT-19. AT-19B 1943 = Observation and photo-survey. POP: 12. AT-19C 1943 = 1p cargo carrier. Either late in the war, or after it was over, various Lend- Lease planes were returned to the US, such as the Fairchild PT-26 Cornells of the RCAF, and the best sources I found claimed that 353 of these were given to the USN. At that time there were other USAAF planes transferred to the USN. The s/ns for this batch were [11294/11646], and they were listed as "Reassignment" and "Reverse Lend-Lease." I have only one documented proof; a letter from a man who owns ex-FB715 and who says it was returned to the US as BuAer 11570. To muddy the waters further, there were 62 Navy serials, [30481/30542], listed as "Duplicate Assignment" for AT-19s by the USN, plus 2 more, [37637/37638], listed as "Cancelled." I don't think that these numbers should be considered as "real" airplanes, and were paper assignments only. The letter "Q" (as in RQ) was only used for Stinson from 1934- 36, according to the latest USN 1910-95 book, and I agreeit was not used for Stinson during WW2. It was not unusual for the USN to use an USAAF designation on something they didn't buy, and if you look at all of the WW2 impressments of civilian planes by the USN, they used the civil designation on their aircraft history cards, etc. For example, the Waco VKS-7 that I photographed at Sherman Field in Oct 1943 (then operated by PAA) was camouflaged, had stars and bars, a Navy s/n  on the fin, and "VKS-7" on the rudder. 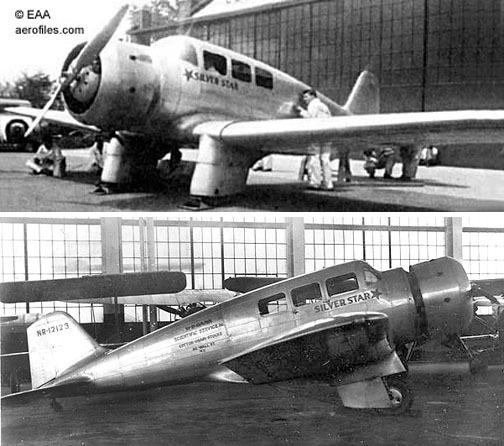 B - Twin version of 1934 Model A airliner with two 245hp Lycoming R-680B was built as a mock-up in 1936, but there was no production. 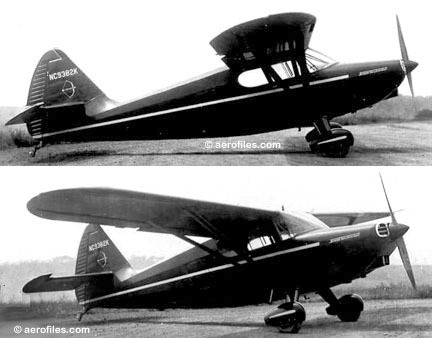 C-81 1941 - Impressed civil SR-8, -9, and -10 Reliants as UC-81 with suffix variants up to -81N. POP: 47 draftees. UC-81 1942 = SR-8B, -9E. POP: 5 [42-53524, -60771, -97057, -107415, -107423]. 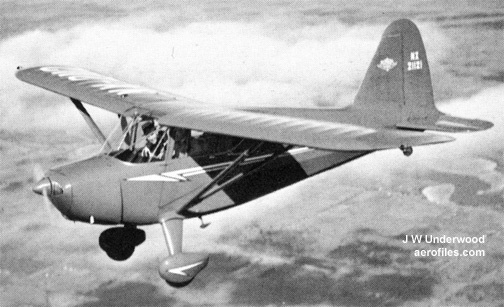 UC-81A 1942 = SR-10G. POP: 2 [42-57225, -56086]. UC-81B 1942 = SR-8E. POP: 1 [42-57510]. UC-81C 1942 = SR-9C. POP: 3 [42-61098, -68691, -107418]. XC-81D 1942 = SR-10F tested as a glider tow while in civil registration; POP: 1 [NX2311]. UC-81E 1942 = SR-9F. POP: 5 [42-38297/38300, -97042]. UC-81F 1942 = SR-10F. POP: 7 [42-22248, -39301/38303, -43516, -53009, -107420]. UC-81G 1942 = SR-9D. POP: 3 [42-49072, -78020, -78042]. UC-81H 1942 = SR-10E. POP: 2 [42-49073/49074]. UC-81J 1942 = SR-9E. POP: 5 [42-53011/53012, -57226, -56088, -68685]. UC-81K 1942 = SR-10C. POP: 6 [42-68343/68346, -97056, -107419]. UC-81L 1942 = SR-8C. POP: 2 [42-78030, -107424]. UC-81M 1942 = SR-9EM. POP: 1 [42-94134]. UC-81N 1942 = SR-9B. POP: 2 [42-107416/107417]. C-91 1942 = Impressed SM-6000. POP: 1 [42-79547], went to Panama. CQ-2 1944 = L-1F used as aerial target controller late in the war. POP: only a few, if any; no s/ns found. One of only three "CQ" designations, with Fletcher CQ-1 and Beech CQ-3. Detroiter aka Detroiter Junior 1926 = 3pCB. 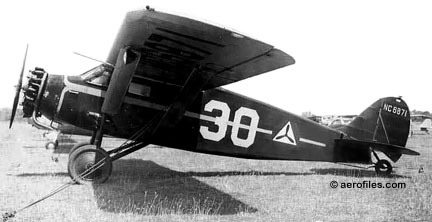 Stinson's first commercial plane. POP: about 12. Became SB-1. Greyhound 1920 = 2pOB; 90hp Curtiss OX-5; span: 34'2" length: 22'4" load: 545# v: 90/65/25. 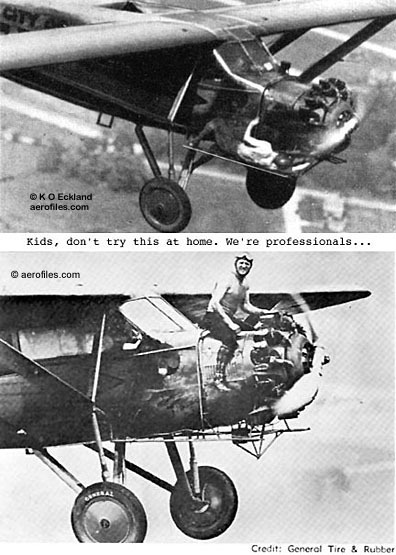 The first Stinson-designed and -built airplane; side-by-side cockpit. Mahogany-lined cockpits, electric starter. POP: 2 [2554, 352V]. Market was "not quite ready," so the project was considered a failure. HW-75 1939 (ATC 709) = 3pChwM; 50hp Lycoming. Prototype for 105 [NC21121] c/n 7000; ff: 2/3/39 (p: Al Schramm). JBS SEE entry on J page. L 1934 = 4pClwM rg; 225hp Lycoming R-680B. Robert Hall. After first testing, experimental taper-wing design was deemed too difficult for average pilot, and was cancelled. POP: 1 [X14199 (later transferred to SR-5X Reliant)]. L-1, -49, O-49 Vigilant aka Vultee-Stinson (Model V74) 1940 - 2pChwM liaison, ambulance, observation. A P Fontaine. Redesignated from O-49 to L-1 in April 1942, with early ones briefly designated L-49. Designations for those in ambulance duties were appended with suffix -VW. L-1, O-49 1941 = 295hp Lycoming R-680; span: 50'11" length: 34'3" load: 732# v: 122/109/44 range: 280 ceiling: 18,000'; ff: 7/15/40 (p: Al Schramm). $21,000; POP: 142 [40-192/291, -3101/3142], of which 14 to RAF as Vigilant IA. L-1A, O-49A 1942 = POP: 182 [41-18900/19081], plus 54 to RAF as Vigilant I.
L-1B, O-49B 1942 = Ambulance conversion from L-1A. POP: 4. L-1C 1942 = POP: 113 converted as ambulances from L-1A. L-1D 194? = Glider tug trainer. POP: 21 converted from L-1A. L-1E 1943 = Amphibious, twin-EDO float-equipped ambulance. POP: 7 converted from L-1. L-1F 1943 = Similar to L-1E with minor modifications. POP: 4 conversions from L-1A and 1 from L-1C, plus a few converted to CQ-2 target controllers. L-1T 194? 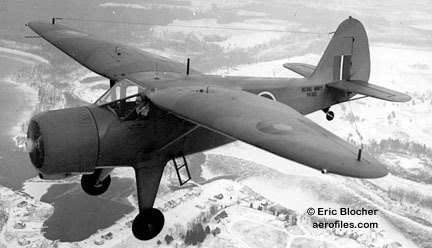 = Glider tug conversion of L-1. L-1 BLC 1944 = SEE The Humpback L-1. L-5, O-62, U-19 Sentinel aka Vultee-Stinson (Model V76) (Stinson-Vultee) - Military liaison, observation, and ambulance. 2pChwM; 175hp Lycoming O-435 (185hp for service use); span: 34'0" length: 24'1" load: 713# (varied with utilizations) v: 129/115/x range: 390 ceiling: 15,800; ff (as Model 76): 6/28/41 (p: Al Schramm) [NX27772]. A P Fontaine. USN version OY. Adapted from 10 Voyager, with wing tanks and glazed cabin. Popularly, but unofficially, known as "Flying Jeep," it became the most widely-used Allied utility plane during the war. Designations for those in ambulance service were appended with suffix -VW. 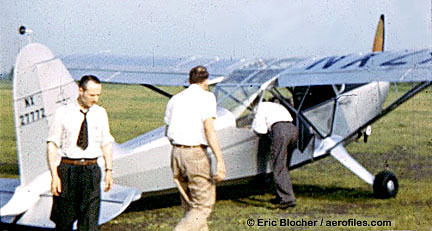 Some surplus L-5s were converted by (Wayne) Clevenger Aircraft Co in 1955 to biplane crop dusters with 220hp Continental W-670. L-5, O-62 1942 (ATC 764) = 185hp O-435-1. POP: 275 as O-62-ST [42-14798/15072] and 1,538 as L-5-VU and -VW [42-98036/99573], included USN/USMC batch as OY (total transfers from L-5, -5B, and -5E numbered 458), and 40 to RAF as Sentinel I for service in CBI theater. Issued 12/17/45, ATC covered all production models. L-5A 1942 = Designation applied to conversions of L-5 with 24v electrical system and revised gear fairings, but all were cancelled, and revisions became standard equipment on later models. L-5B 1942 = Opening aft hatch for stretcher or 200# cargo; twin-float capability. POP: 730 [42-99574/99753, 44-16703/17102, -17104/17252], included USN/USMC batch as OY-1, and 60 to RAF as Sentinel II. L-5C 1944 = Photo-recon version of L-5B with K-20 camera. POP: 200 [44-17253/17452]. L-5D 1943 = L-5C modification from L-5 in service. L-5E 1944 = STOL capability with 15-degree drooped ailerons; larger brakes. POP: 750 [44-17453/18202], included USN/USMC batch as OY-2. One modified by NACA in 1948 with 5-paddle-bladed prop and geared-down engine (2.8:1) in tests as a low-noise stealth recon [44-17939]. XL-5F 1945 = 24v electrical system. POP: 1 [44-17103]. L-5G 1945 = 190hp O-435, controllable-pitch prop, new radios. POP: 115 [45-34911/35025, 57-6278], the last one redesignated as U-19B. 785 orders were cancelled at the end of hostilities. U-19B 1957 = L-5G used as a glider tug at AF Academy, was active up to 1962. POP: 1 [57-6278]. L-9 (AT-19) - USAAF personnel transport. 3pChwM. Civil Voyager impressed by USAAF in a utility role. Provisionally AT-19A and -19B, but that designation went instead to Lend-Lease Stinson Reliant. L-9A 1942 = 90hp Franklin O-200. POP: 8 [42-88666/88673]. L-9B 1943 = As previous, but 90hp Franklin AC-199. POP: 12 [42-94130, -94136, -97051, -97430, -97432, -97434, -107278, -107406/107410]. L-12 Reliant 1944 = USAAF personnel transport. 4pChwM; data same as SR-5. POP: 4 [44-52992, -52994/52996]. M 1932 = 5pClwM; 300hp Wright J-6 v: x/140/x. All-metal; full-panted gear. POP: 1 [NR12123] c/n 32000. Repowered with 400hp Wright as Silver Starfor competition in the 1934 Nationals, but did not run. O 1933 (ATC 520) = 2pOhwM; 220hp Lycoming R-680-4; span: 39'11" length: 27'8" load: 710# v: 136/122/50 range: 400-450 ceiling: 16,000'; ff: 5/x/33. Robert Hall. The only open-cockpit Stinson ever built used a basic SR wing in a parasol configuration. POP: 9: 1 civil prototype [X13817], 3 each to China and Honduras, 1 each to Argentina and Brazil as armed military trainers. O-54 1941 = Army evaluation of civil 10 Voyager. POP: 6 as YO-54 [41-143/148]. OY-1, -2 1943 = USAAF L-5/-5B/-5E transferred to USN/USMC. POP: 306 [02747/02788, 03862/04020, 60460/60507, 75159/75182, 120442/120474]. 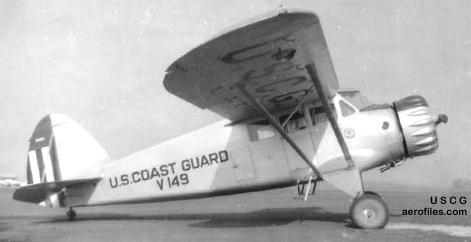 "Y" designation came after merger of Stinson with Consolidated and explains why the series was often called Convair OY-1/-2. OY-2 converted to 24v electrical system in 1943. Some modified in Korean War by USMC as support aircraft with strut-mounted bazooka rockets. R, R-1 1932 (ATC 457) = 4pChwM; 215hp Lycoming R-680; span: 43'3" length: 26'1" load: 1100# v: 130/110/52 range: 450 ceiling: 12,500'. Robert Ayer, C R Irvine. A deluxe Junior, forerunner of Reliant. R-1 was to have a retractable gear added, but was never built. $5,595; POP: 30 [NC436M/440M, NC446M/448M, NC479M, NC10861, NC10874, NC10876, NC12134, NC12139, NC12147/12156, prototype NC12178, NC12189, NC12197, et al]. Eddie Stinson was fatally injured in a crash landing of the prototye R on 1/25/32. R-2 1932 (ATC 489) = 4pChwM; 240hp Lycoming R-680; span: 43'3" length: 26'2" load: 1210# v: 138/118/62 range: 550. Was advertised for $6,497 with retractable gear modification, but none was produced as such. POP: 3 [NS40, NX447M, NX12178] modified from R, possibly one other. R-3 1933 (ATC 493) = Same as R-2, but with fixed, non-operating prototypical retracting gear; load: 1210# v: 133/112/62 range: 450. Only one was so modified to operating retractable gear as R-3S. $5,995; POP: 3 [NC449M, NC12131, NC12187]. R-3S 1934 (ATC 539) = 4pChwM rg; 245hp Lycoming R-680, controllable prop and other improvements; span: 43'4" length: 26'2" load: 1010# v: 133/112/52 range: 450. POP: 1 converted from R-3 [NC449M]. RQ, R3Q 1934-35 = Utility transport, SR-5A in naval uniform. 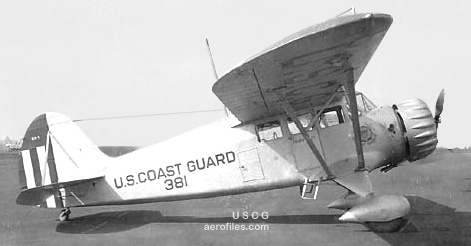 POP: 1 to USN in 1934 as XR3Q-1  and 1 to USCG in 1935 as RQ-1 [381=V149]mismarked on its tail as QR-1then in 1937 renumbered [V149] and redesignated R3Q-1. S Junior 1931 (ATC 423) = 4pChwM; 215hp Lycoming R-680; span: 42'1" length: 28'11" load: 1093# v: 128/125/48 range: 400. $4,995, $4,595 in 1932; POP: about 35. SB-1 Detroiter 1926 (ATC 24, 2-330) = 4-5pCB; 220hp Wright J-4, later models with 220hp J-5; span: 33'9" length: 28'1" load: 1200# v: 125/105/45 range: 500 (prototype); span: 35'10" length: 28'10" load: 1470# v: 125/100/46 ceiling: 13,500' (production). Electric starter; individual wheel brakes. $11,000-12,000; POP: 26. 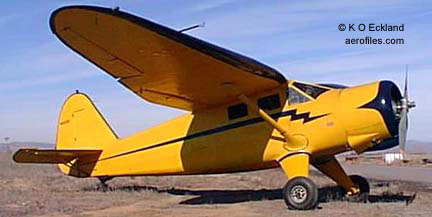 First production model by Stinson, first planes went to Northwest Airlines. (2-330) in 1931 for 200hp Wright J-4 as Detroiter Special (3 conversions). SM-1 Detroiter, Special 1927 (ATC 16, 2-174) = 6pChwM; 220hp Wright J-5; span: 45'10" length: (?>32'0") load: 1515# v: 128/105/55 range: 600-700; ceiling: 14,000'; ff: 4/x/27. William Naylor. Prototype [X1524]. $12,500; POP: ? ?, of which 7 as SM-1 Special. Took first place in 1927 Ford Air Tour [NC857]. First Braniff Airways plane (1928). (2-174) issued in 1930 for increased load as SM-1 Special [NC3647]. SM-1B, Special 1928 (ATC 2-24, 2-224) = Allowable weight increase. POP: 36 [NC3696, NC4185, NC4473, NC4876, NC5189, NC5485, NC5639, NC5676, NC5679, NC5683/5684, NC5741, NC5993, NC6657, NC6764, NC6827/6828, NC6868/6869, NC7023/7024, NC7127, NC7168, NC7218, NC7313/7314, NC7369, NC7422, NC7468/7470, NC7472/7474, NC7575/7576] plus some conversions from SM-1. (2-224) in 1930 for 5p SM-1B Special [NC3348, NC5325, NC6763]. SM-1D Special, -1D-300 1929 (ATC 60, 2-60, 2-142) = 220hp Wright J-5 conversion. POP: 1 [NS6762] c/n D-302, was SM-1DA. 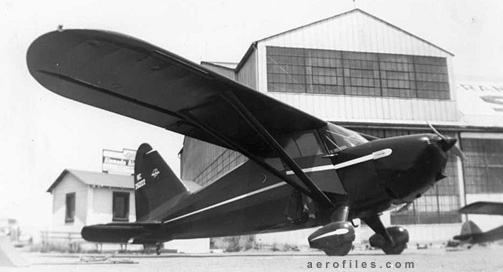 (2-60) was for 300hp Wright J-6 as SM-1D-300. SM-1DA 1928 (ATC 74) = 6pChwM; 220hp Wright J-5; load: 2068# v: 120/105/60 range: 750. $12,500; POP: 5 [NC5900, NC6762, et al]. SM-1DB 1928 (ATC 76) = SM-1DA with interior refinements; load: 1978#. POP: 1 [NC6580]. SM-1DC 1928 (ATC 77) = 2p cargo version of SM-1DA; load: 1986#. SM-1DD 1928 (ATC 78) = SM-1DA with greater load for bush operations: 2220#. POP: 1 [NC486H]. SM-1DX 1928 (ATC 2-228) = 3pChwM; 225hp Packard diesel (first diesel to fly). L M Woolson. POP: 1 [X7654]. 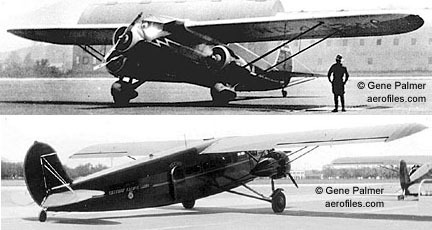 SM-1F, -1FS 1929 (ATC 136, 212) = 6pChwM; 330hp Wright J-6; span: 46'8" (?>47'1") length: 32'8" load: 1686# v: 132/115/56 range: 650 ceiling: 17,000'. $11,000-13,500. SM-1FS was floatplane version under (212) for about $15,000. POP: about 26. SM-2 Junior 1928 (ATC, 48) = 3-4pChwM; 110hp Warner Scarab; span: 41'5" length: 26'3" load: 984# v: 106/90/42 range: 425 ceiling: 13,500'. William Naylor. $6,950; POP: about 27. Predecessor of SR Reliant series. SM-2A 1929 = POP: 1  c/n M-1047. SM-2AA 1929 (ATC 145, 2-73) = 165hp Wright J-6; span: 41'6" length: 26'4" load: 1180# v: 115/97/47 range: 580. $8,500; POP: 22. (2-173) for weight adjustment. SM-2AB 1929 (ATC 161, 2-267) = 165hp Wright J-6; load: 1060# v: 130/112/49 range: 600 ceiling: 15,000'. $10,500; POP: 32. (2-267) for 220hp Wright J-5 and EDO floats in 1930. SM-2AC, -2ACS 1929 (ATC 194, 2-143) = 225hp Wright J-6; span: 41'6" length: 28'6" load: 1126# v: 132/113/49 range: 600. $11,000. SM-2ACS was floatplane version under (2-143) for $13,500 [possibly NC8475]. SM-2K, Special 1929 (ATC 2-136, 2-414) = 3pChwM; 100hp Kinner K-5. POP: 3 conversions. (2-414) for 125hp Kinner B-5 in 1932 as SM-2K Special. SM-3 1927 = 4pClwM rg; 220hp Wright J-5C. POP: 1 prototype for retractable gear tests. Tapered, strut-braced gullwing. Flown in one test by Eddie Stinson, who likened its flight characteristics to "a brick" and cancelled the project in 1928. SM-4 Junior 1929 = 2pChwM rg; 300hp Wright R-975. POP: 1 special retractable-gear endurance plane Sally Sovereign developed from SM-1 [X9696]. Damaged in a wheels-up landing after a failed endurance flight (p: Eddie Stinson, Randolph Page). Rebuilt with fixed gear as K of New Haven for an aborted attempt at a US-Argentina non-stop flight on 7/15/30, when the crew became lost in a fog over Georgia and ran out of gas. They bailed out and SM-4 crashed to destruction. 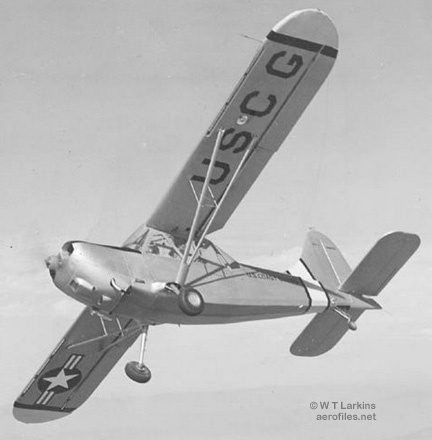 SM-5 1929 = ClwM; Wright J-5, later J-6. Possibly a development of SM-3. POP: 1 [NX9625] c/n X-11. SM-6A, -6B Detroiter 1929 (ATC 217, 2-89) = 7-8pChwM; 420hp P&W Wasp C; span: 52'8" length: 34'4" load: 1854# v: 148/128/60 range: 575 ceiling: 18,000'. $18,500, $15,995 in 1930; POP: 12. (2-89) for increased weight. 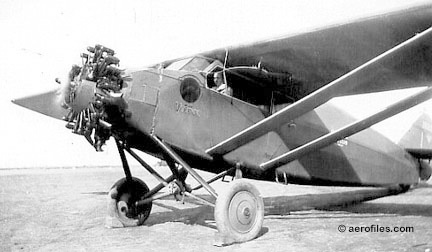 Also produced in Perú 1934-36 as the larger, bush version Stinson-Faucett F-19 (SEE entry below). SM-7A, -7AS Junior 1930 (ATC 298, 2-313) = 4pChwM; 300hp Wright J-6; span: 41'8" length: 30'11" load: 1266# v: 142/120/60 range: 550. $8,995; POP: 8. (2-313) for float version as SM-7AS. SM-7B 1930 (ATC 329) = 300hp P&W Wasp Jr; span: 41'8" length: 29'11" load: 1188# v: 142/120/60 range: 550. $10,695; POP: 8. SM-8A Junior, Special 1930 (ATC 295, 2-301, 2-461) = 4pChwM; 210hp Lycoming R-680; span: 41'8" length: 28'11" load: 1134# v: 125/105/55 range: 500. Kenneth Ronan. $5,775; POP: about 300. (2-461) for 220hp Wright J-5 as SM-8A Special in 1933 [NS13] c/n 4091, destroyed in a fire Aug 1934. SM-8B 1930 (ATC 294) = 225hp Wright J-6 for $8,495; POP: 5, of which 3 converted to SM-8B Special [NS25, NS27=NC18627, NS28=NC18628]. SM-8D 1930 (ATC 312) = 225hp Packard DR-980 diesel; span: 41'8" length: 29'0" load: 1025# v: 128/108/50 range: 495. $8,995; POP: 2 [NC200W, NC227W]. 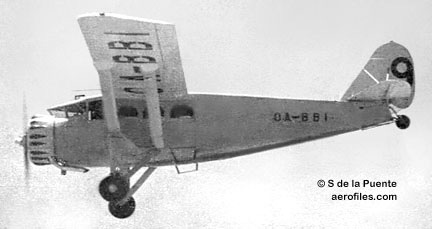 SM-9 1930 = Experimental amphibian. 4pCMAm; 215hp Lycoming R-680. POP: 1 [NX414Y] c/n M-9000. Scrapped after a crash-landing. SM-6000 aka Model T 1930 (ATC 335) = 11pChwM; three 215hp Lycoming R-680; span: 60'0" length: 42'10" load: 2930# v: 138/115/65 range: 350 ceiling: 14,200'. From Corman 3000. $18,000-23,900; POP: 10 [NC429Y, NC475Y, NC497Y/498Y. NC974W/979W], of which 1 to USAAF as C-91. Evolved into U model. SM-6000-A 1931 (ATC 367, 420) = Deluxe 12p version; load: 2900# v: 146/122/60 range: 500-600 ceiling: 15,000'. 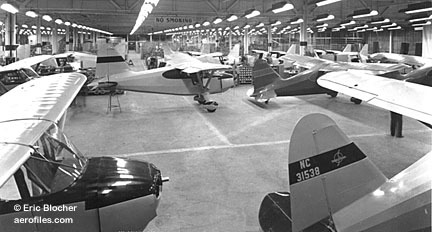 Later production under ATC 420. $25,000; POP: uncertain, perhaps included in -6000-B total; several were upgrades from -6000. SM-6000-B 1931 (ATC 420) = Modified with luxury interiors, cowlings, and wheel pants for increase in payload and performance; v (with engine cowls and wheel pants) 146/125/65. 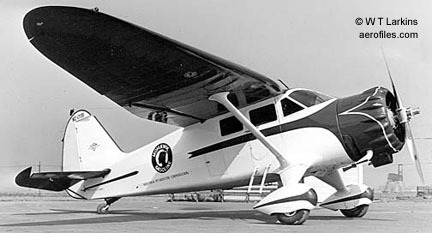 SM-6000-B1 accommodated 10 passengers, -6000-B2 was for mail and 8 passengers; 6-8p Club model was customized for executives as an "airborne office," likely America's first dedicated corporate plane. $25,000 for basic plane (reduced to $19,500 in 1932); POP: about 40, possibly includes -6000A. SR Reliant, Special 1933 (ATC 510, 2-471, 2-499) = Replacement for the R series. 4pChwM; 215hp Lycoming R-680; span: 43'3" length: 27'0" load: 1085# v: 133/115/55 range: 460 ceiling: 14,000'. Lloyd Skinner. $3,995; POP: 88, of which 2 were SR Special: 1 under (2-499) [NS3=NS6] and 1 with 240hp R-680 under (2-471) [NS81Y=NC13542]. SR-1 Reliant, Special 1933 (ATC 513, 2-496) = 4pChwM; 240hp Lycoming R-680; span: 43'3" length: 27'0" load: 984# v: 135/118/55 range: 440 ceiling: 15,000'. POP: 2 [NC13485, NC13499], of which the first became SR-1 Special with 225hp R-680 under (2-496). SR-2 Reliant 1933 (ATC 510) = SR with equipment additions and weight adjustment. POP: 1 to Pennsylvania Aeronautics Dept [NS13832]. 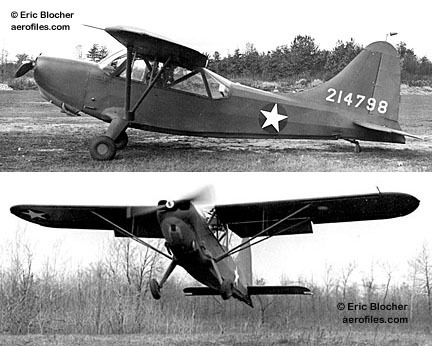 SR-3 Reliant 1933 (ATC 513) = SR-1 with slight differences in tail group and added equipment; load: 993#. POP: 2. SR-4 Reliant 1933 (ATC 519) = 4pChwM; 250hp Wright R-760; span: 43'3" length: 27'0" load: 1088# v: 138/122/57 range: 360. POP: 2 [NC1328, x]. SR-5 Reliant, Special 1934 (ATC 530, 2-492, 2-494) = 4pChwM; 225hp Lycoming R-680; span: 41'0" length: 27'2" load: 1075# v: 132/120/56 range: 430. Without flaps. $5,774; POP: 11 [NX13834, NC13836/13838, NC13843/13847, NC13649, NC13856]. (2-492) for smaller tail, wing flaps as SR-5 Special for [NX13834] and [NC13836]; (2-494) for 245hp R-680 [NC13838]. (530) later extended to cover SR-5A and -5E. SR-5A, Special 1934 (ATC 536, 2-491, 2-511) = 4pChwM; 245hp Lycoming R-680; span: 41'0" length: 27'3" load: 1150# v: 135/120/50 range: 600 ceiling: 15,500'. POP: about 75, of which 2 served in Army as L-12 in 1942, 1 each to USN and USCG as XR3Q-1 and RQ-1 in 1935. (2-491) for EDO float conversion; (2-511) as SR-5A Special with weight adjustment. (536) later cancelled and replaced by (530). SR-5B 1934 (ATC 530) = 240hp Lycoming R-680; POP: 1. SR-5C 1934 (ATC 530) = Added flaps and 260hp Lycoming R-680; POP: at least 6. SR-5D 1934 (ATC 536, 2-493) = 215hp Lycoming. 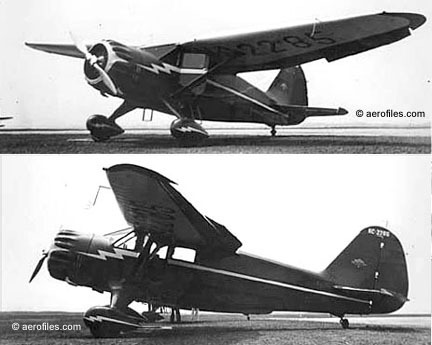 POP: 1 as a cargo version with wood prop and smaller tail. SR-5E 1934 (ATC 537) = 225hp Lycoming R-680; span: 41'0" length: 27'2" load: 1075# v: 133/120/56 range: 450. $5,775; POP: 52. (537) later cancelled and replaced by (530). 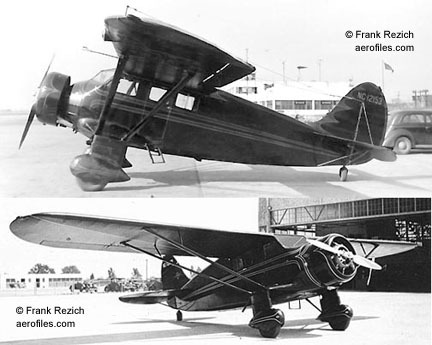 SR-5F 1934 (ATC 550) = Custom-built SR-5E. POP: 2; one each with 285hp Wright Cyclone [NC14156] and 250hp Wright Cyclone [NC14162]. SR-5X 1934 = 245hp Lycoming R-680. POP: 1 prototype SR-6 [X14199]. SR-6 Reliant 1935 (ATC 580) = 4-5pChwM; 245hp Lycoming R-680; span: 43'3" length: 27'0" load: 1235# v: 140/128/52 range: 470-695. $6,000-9,000; POP: total about 50. SR-6A 1935 (ATC 580) = 225hp Lycoming R-680; load: 1015# v: 137/125/50 range: 470. POP: 3. SR-6B 1935 (ATC 580) = 260hp Lycoming R-680; load: 1203# v: 142/130/52 range: 455-600. $6,995; POP: 3. SR-6C 1935 (580) = 240hp Lycoming R-680. POP: 1, possibly never completed. SR-6X 1935 (ATC 580) = Experimental model of SR-6; use unknown, possibly prototypical. POP: 1 [NC15139]. SR-7 Reliant - First of the distinctive "gull-wing" SR series. 4-5pChwM. Robert Hall, Harold Hoekstra, C R Irvine, Lloyd Skinner. SR-7B 1936 (ATC 594) = 225hp Lycoming R-680-B4 and 245hp R-680-B6; span: 41'7" length: 27'0" load: 1115# v: 144/136/53 range: 475 ceiling: 12,300'. $6,485; POP: 47. SR-7C 1936 (ATC 594) = 260hp Lycoming R-680-B5. POP: 3. SR-8 Reliant - 4pChwM. M-suffix denoted "Multi-purpose" cargo modified models. SR-8A 1936 (ATC 608) = 225hp Lycoming R-680-B4; span: 41'7" length: 27'0" load: 1113# v: 145/136/53 range: 475 ceiling: 12,800'. $6,500; POP: 2 [NC16145, 16172]. SR-8B, -8BM 1936 (ATC 608) = 245hp R-680-B6; length: 27'2" load: 1400# v: 147/138/57 range: 645 ceiling: 13,800'. SR-8BM was cargo model with double doors on the right side, metal cabin walls, removable seats. $10,000; POP: 57, of which 1 converted to SR-8C [NC16142]; 4 to USAAF as UC-81. SR-8C 1936 (ATC 608) = 260hp R-680-B5; load: 1350# v: 148/140/57 range: 639 ceiling: 14,500'. $10,000; POP: 20, of which 2 to USAAF as UC-81L. SR-8D 1936 (ATC 609) = 285hp Wright R-760-E1; span: 41'7" length: 21'2" load: 1405# v: 150/140/58 range: 645. $10,500; POP: 11..
SR-8E 1937 (ATC 609) = 320hp Wright R-760-E2; load: 1335# v: x/155/58 range: 525 ceiling: 18,500'. $12,000; POP: 35, of which 1 to USAAF as UC-81B. SR-9 Reliant - 5pChwM. First Reliants to have curved windshields, as well as other streamlining. SR-9B, -9BM 1936 (ATC 621) = 245hp Lycoming R-680-B4; load: 1243# v: 147/136/55 range: 610. Available in SR-9BM cargo version (one of which used to test 310hp Guiberson A-1020 in 1942 [NX17192]). $9,385; POP: 35. To USAAF as UC-81N. SR-9C, -9CM 1936 (ATC 621) = 260hp Lycoming R-680-B5; load: 1235# v: 148/140/57 range: 690. SR-9CM was cargo version. $10,000; POP: 65. To USAAF as UC-81C. SR-9D 1937 (ATC 625) = 285hp Wright R-760-E2; span: 41'11" length: 28'1" load: 1450# v: 152/140/60 range: 630 ceiling: 14,500'. $12,000. To USAAF as UC-81G. SR-9E 1937 (ATC 625) = 320hp Wright R-760-E2; load: 1410# v: 161/150/60 range: 600. $12,500; POP: 43. To USAAF as UC-81J. Also 1 in -9EM cargo version [NS/NC3640], impressed by AAF in WW2 as UC-81M [42-94134]. One experimental model with 310hp Guiberson D diesel [NX17132]. SR-9F 1937 (ATC 640) = 400hp P&W Wasp; span: 41'11" length: 27'11" load: 1510# v: 173/165/63 range: 500. $18,000; POP: 34. To USAAF as UC-81E. SR-9FM 1937 = "Multi-purpose" cargo version [NC89]. SR-9FD 1937 = "Deluxe" model; 450hp P&W and extra fuel tank for 850-mile range [NC2215]. SR-10 Reliant = 5pChwM; Gordon Israel. SR-10B 1938 (ATC 678) = 245hp Lycoming R-680-D6; span: 41'11" length: 27'8" load: 1345# v: 150/147/57 range: 660. Sold as an "economy model" for $9,995; POP: 2 [NC18480, GAFHB]. SR-10C 1938 (ATC 678) = 260hp Lycoming R-680-D5; load: 1345# v: 150/147/57 range: 660. Sold as "standard model." $10,995; POP: 53. To USAAF as UC-81K. SR-10D 1938 (ATC 679) = 300hp Wright R-760-E1; span: 41'11" length: 27'9" load: 1425# v: 160/150/60 range: 650-780. $14,000; POP: 3 exports to Brazil. SR-10E 1938 (ATC 679) = 320hp Wright R-760-E2; load: 1420# v: 163/155/60 range: 620+. $14,350; POP: 21, of which 1 impressed by USAAF as UC-81H, and 1 to Argentina. SR-10F 1938 (ATC 685) = 450hp P&W Wasp; load: 1605# v: 177/170/63 range: 800. Last of the civil Reliants. POP: 18, with 8 impressed by USAAF as UC-81F, with one tested as XC-81D glider tow in civil registration [NX2311]. SR-10G 1938 (ATC 678) = 290hp Lycoming R-680-E1; load: 1395# v: 160/150/59 range: 700 ceiling: 15,000'. $12,585. POP: 12. To USAAF as UC-81A. SR-10H - 265hp Lycoming R-680. No records found of any being built. SR-10J aka Vultee V77 1941 (ATC 774) = 1-4pChwM; 285-300hp Lycoming R-680; load: 2610# range: 675 ceiling: 16,500'. POP: 11, plus 500 military versions principally for Lend-Lease to Great Britain as Reliant I through IV instrument trainers and cargo ships. Of this lot, 62 were impressed by USN, but apparently did not get the pre-war Navy designation of RQ. SEE the sidebar at AT-19. SR-10K 1938 (ATC 679) = Special modification of SR-10F with 450hp (420hp?) Wright R-975-E3 for NYC Police Dept. $19,000; POP: 2 [NC21147/21148]. Twin-Stinson SEE Piper PA-21, PA-23. U 1932 (ATC 484, 2-413) = 10-12pCswM; three 240hp Lycoming R-680BA; span: 66'2" (stub-wing 14'3") length: 45'3" load: 3100# v: 145/123/60 range: 450-500 ceiling: 14,000'. Art Saxon. Almost a sesquiplane with its stub wings on the undercarriage. $19,500; POP: 23 for American Airways, included 1 for competition [NR/NC12127], and 1 experimental model that crashed 8/2/33 [X12132]. (2-413) was a weight adjustment for prototype [X/NC432M] c/n 9000. 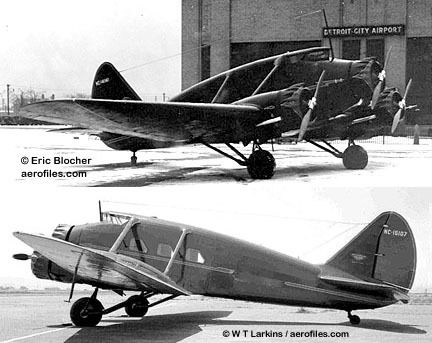 U-1 1933 (2-437) = 11p Model U with three 285hp Wright R-760. POP: 1 for Eastern Air Transport [X12129] c/n 9014. W 1931 (ATC 435) = 4pChwM; 300hp P&W Wasp Jr; span: 42'1" length: 30'10" load: 1271# v: 143/122/60 range: 470. Deluxe version of Junior. $8,995; POP: 5 [NC10849, NC12144, NC12146, NC12160, NC12177]. -Faucett F-19 = Larger and stronger version of SM-6B built in Lima, Perú, by Elmer J "Slim" Faucett's Compania de Avación Faucett, with 600hp P&W Wasp S1H1-G, using a supplied pattern aircraft [NX219W]; span: 58'0" length: 38'8" load: 2975# v: 160/135/65. POP: 30, of which some were refitted with 875hp P&W Hornet S1E3-G. POP: 30 between 1934-46, of which 3 were reportedly still active in the late 1990s. -Vultee L-5, O-62, OY, U-19 SEE L-5. -Vultee V74, V75, V76l SEE L-5.